The Premier Easy Walk Harness is a harness designed to help prevent your dog from pulling on the leash during walks. This harness has one strap that goes around a dog's shoulders and belly, then another strap that comes around his chest. A leash clips onto a metal loop on the chest. The metal leash loop is connected to a nylon loop which tightens across the dog's chest as a dog pulls. This tightening causes the dog to redirect his motion, preventing the dog from pulling on the leash. I picked up this harness with serious doubts. My dog, Toby, is usually obedient, but like most adolescents, he's easily distracted. On walks, he can have my arm half pulled out of the socket before I can give him the "with me" command. Initially, it took me a little longer than I anticipated to get the harness on Toby. While having 4 different adjustment points gives you the ability to custom fit the harness, it can be tough to get a dog to wait calmly while you adjust even one. The good news is you only have to adjust the harness the first time you use it, and maybe once or twice after that to accommodate a growing dog. From the moment I snapped on Toby's leash, I was amazed. Anytime he attempted to pull, the harness tightened and pulled him to the side a bit. This caused his forward motion to be redirected back towards me and stopped the pulling. Walks are much more pleasant since I started using this harness. It took me more than a few uses to get the hang of putting this on Toby. Even now, I twist it around a few times before I figure out exactly how it needs to go on. It's a small price to pay, however, for something that makes taking the dog for a walk so easy. I do have one caution. The Premier Easy Walk Harness is not going to train your dog to walk on a leash without pulling. It is a tool to help you manage your dog's behavior. If you are interested in obedience training, you'll still need to put the work in to train your dog to heel or walk on a loose leash. But if what you're after is an enjoyable walk with your dog, this may be just thing for you. Takes very little time for most dogs to adjust to wearing the harness. 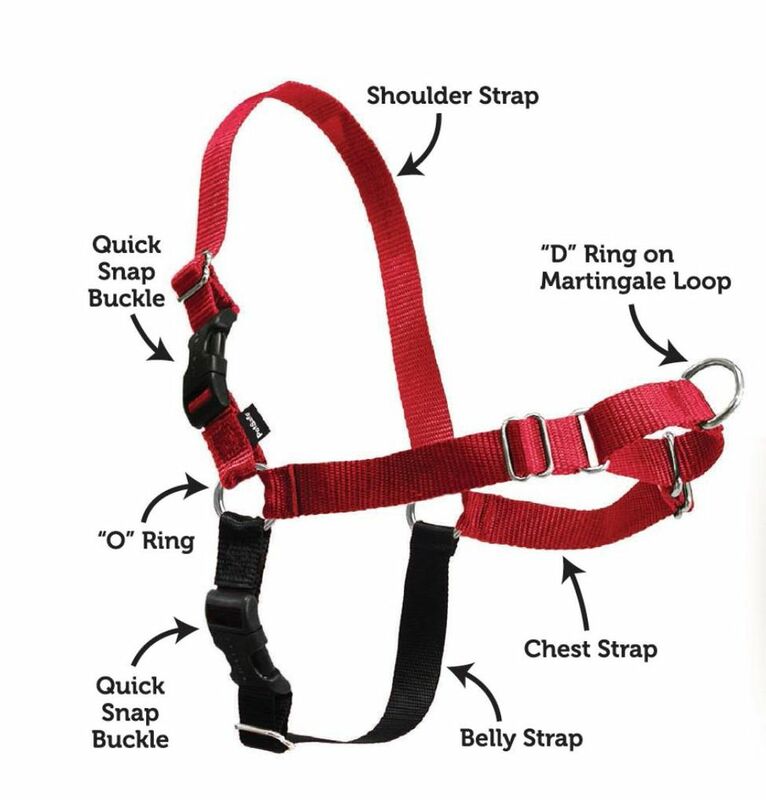 4 separate adjustment clips allow you to custom fit the harness to your dog. The belly strap is a different color than the rest of the harness to make it easier to determine which piece goes where. Immediate gratification--dogs walk better on ​the leash from almost the instant it goes on. Can be difficult to get on, especially if you're working with a wiggly dog. Some dogs may take a little longer to acclimate to wearing a harness. If not fitted properly, it may chafe beneath dog's front legs.